I have been posting small business chats on this blog for well over a year, and so I’ve been catching up with some of my interviewees from this time last year. We’ve done some great work, for some great clients and the business is continuing to grow. Whilst I haven’t yet employed a part time administrator, we are using the services of more freelancers to free up my time for more business development. The growth has been a little more sporadic than I would have hoped for but I see this as a characteristic of the economy at the moment. Given the state of the UK economy and the length of the recession, I’m pleased that we’ve continued to maintain any kind of growth at all! I’ve seen a change in the type of marketing that clients are asking for. There’s been an increase in the amount of digital marketing that we’re being commissioned to do. Businesses are being far more cautious with their budgets and digital marketing tactics are far more cost effective, with clients (and us) being much better able to gauge the success of a digital campaign and more accurately measure the return on investment. I think this will be a legacy of the recession, with far more clients relying on digital marketing to promote their businesses in the future. I’m sure there will always be a place for traditional marketing methods but as more clients, and consumers, are becoming online savvy, traditional marketing will become the exception, rather than the rule. In terms of what has stayed the same… clients are still reluctant to pay invoices on time! I’ve learnt that it’s possible to maintain growth during an economic downturn but you need to adapt your business, to suit the market conditions and the demands of the audience. We’ve recently become a Google affiliated Adwords partner. I wish I’d known how beneficial this would be, in terms of attracting new customers a year ago. I would have taken the necessary steps to become certified, far sooner. I would say – don’t use the state of the economy as an excuse not to set up on your own. Whilst it is pretty tough out there at the moment, there’s still money to be made. Businesses that have set up and survived during a recession, will be in a far better position to flourish and expand, once the economy has stabilised. Whenever that may be! I’m positive that we will continue to maintain growth. It’s difficult to predict the extent of any growth, given the instability of the market, and you never know what’s around the corner! All I can say is – watch this space! Well, that’s all nice and positive, isn’t it! And of course I applaud the outsourcing to freelancers that Matt mentions! But seriously, he’s right: if you can start and keep a business going during a recession, you’re tough enough to survive in any economic conditions. It’s an exciting time to be in business, and the key is to keep flexible, diversify, and tailor your services to what your customers are asking for. Thanks, Matt, and we’ll look forward to hearing from you in another year’s time …And we did! The Lean Marketing website can be found at www.lean-marketing.co.uk – why not pay them a visit and see what they can do for you? You can email Matt or call him on 0845 519 5249 or 07990 503 931. This is one that came up in something I was editing a few days ago. And, I admit, one that I had to check in the dictionary. I was pretty sure the writer wanted unmeasurable (I was right), and I wasn’t sure that immeasurable was a word (I learned something, notably that SpellChecker doesn’t think it’s a word, which is why we still use dictionaries!). Unmeasurable means, specifically not able to be measured objectively. We use this one in the literal sense: “the immense lizard was unmeasurable with the tiny ruler in the standard lizard measuring kit”; “the sea trench in which the angler fish lived was of an unmeasurable depth”. Immeasurable means, a bit less specifically, I suppose, too large, extensive or extreme to measure. We should reserve this one for the more figurative sense (otherwise there’s no point in having two different words, is there, and where would THAT leave us? ): ” the immeasurable mercy of their god”; “he had immeasurable ambition”. In this post we looked at AutoCorrect, and automatic formatting is really an aspect of AutoCorrect – although I find it’s more annoying than useful, I have to admit. 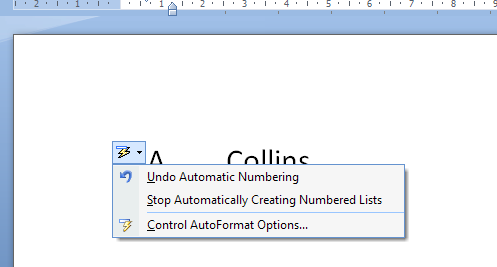 In this post I’ll show you where to find auto formatting, what it does, and how to turn it off. 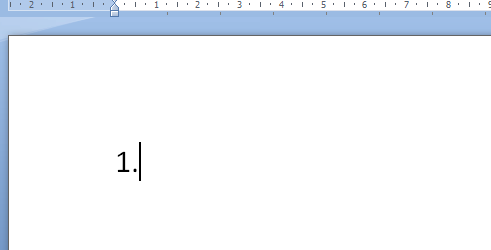 Automatic formatting is basically Word trying to be helpful. Instead of a Paperclip Man or cartoon dog popping up in the corner of your screen, it will try to guess what you’re doing and format it to what it thinks you want. This can be very useful, or it can drive you mad, depending on context. Where do I find the AutoFormat menus? The two features we’re interested in are AutoFormat and AutoFormat As You Type. What is the AutoFormat menu for? 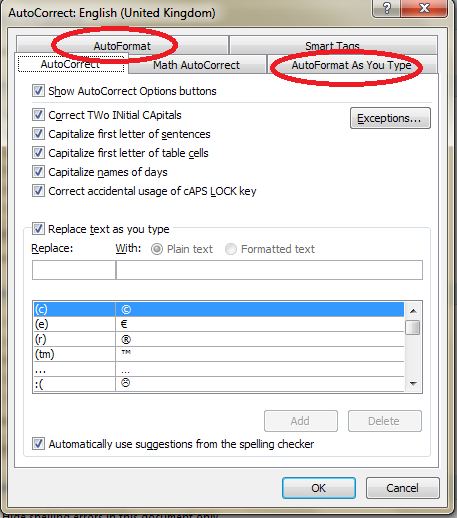 This is how you tell Word what you want to automatically format – however, whatever you change here doesn’t affect AutoFormat as you type. In fact, if you search on Google or in Word’s own help menus, it’s hard to find out what to do with this menu. I can tell you, after exhaustive research, that this menu is used to format your document after the event, at the end, when the document has already been created. By pressing OK, you will apply all of the automatic formats that you have ticked to the document in question. You can pick and choose which ones you apply, and they are all pretty self explanatory, and you can ask it to retain the styles already set up in the document if you want to. 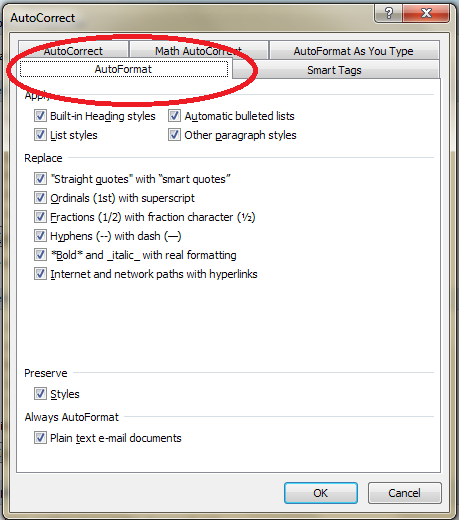 What is the difference between AutoFormat and AutoFormat As You Type? AutoFormat is used to format the document after it’s been written. 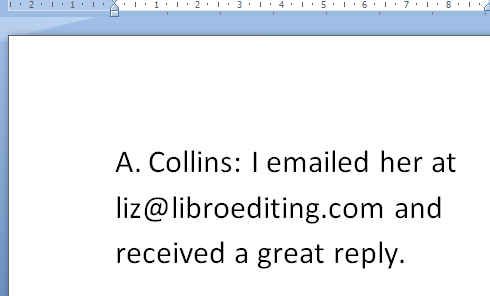 This is particularly useful if you’re sent a document to use which has the “wrong” quote marks, etc. AutoFormat As You Type is used when you’re creating a new document, so you can automate the format and make it consistent as you go along. What is the AutoFormat As You Type Menu For? 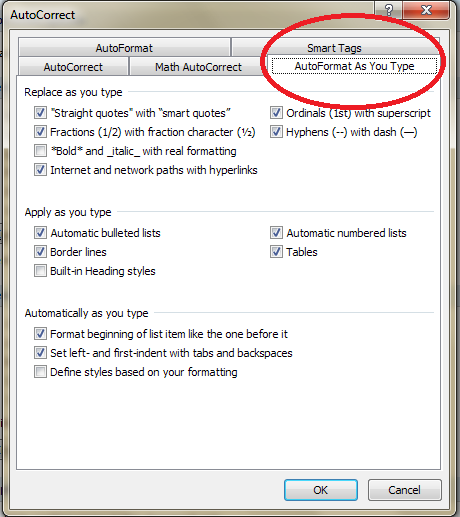 The AutoFormat As You Type menu allows you to choose what Word helpfully automatically formats for you. Let’s have a look at the menu: just click the relevant tab if you’re looking at AutoCorrect or AutoFormat. Let’s look at what these do in your document … and then how you can stop this if you want to. What does AutoFormat As You Type do? 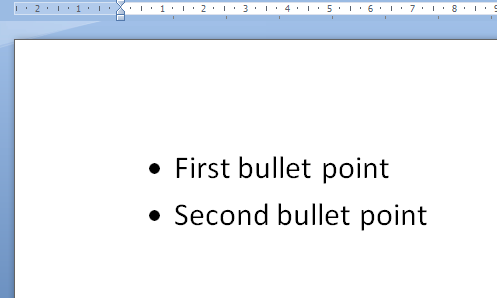 and then a space, for example, it will turn them into bullet points for you! As you can see, you do need that full stop after the number, otherwise it doesn’t “realise” you’re writing a list. It does it with letters, too, which is all well and good, until you happen to start the line with the letter A, but you don’t want to create a lettered list. What do I mean by this? 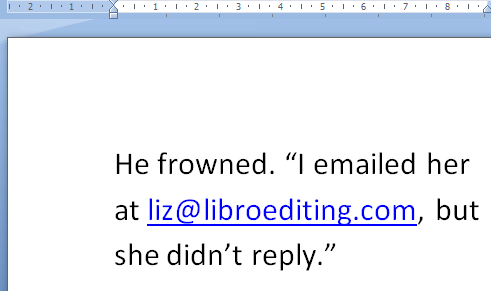 and Word springs into action, handily giving me that little icon to show that it’s making me a list. But it’s still rather annoying. 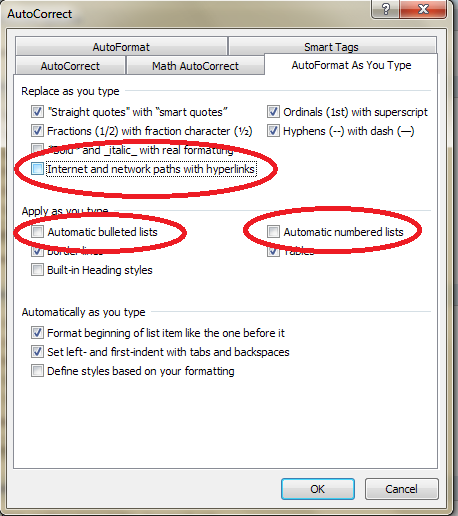 How do I stop Word applying AutoFormatting As You Type? Now you can type whatever you want and Word will leave it as it is, and won’t try to “help” you. Welcome to another Saturday small business chat. Today I’m thrilled to announce we’re talking to Jane Badger, of Jane Badger Books, who sells pony books online. Jane also has a fab blog, which features book reviews, daily countryside walks with Jane’s dog, articles on the history of pony books (about which Jane is also about to publish a book) and marvellous archive clippings from pony magazines about outlandish outfits and fancy dress competitions. Jane is the person who found out the outcome of the Win Flicka competition I found in the back of a paperback, so she’s a useful person to know! Jane Badger Books – I started off in 2004. Royal Mail Consulting, for whom I used to do a lot of freelance writing, closed down, and I needed something I could do which fitted in with my children. Running a book business is always something I’d thought of doing, and I could manage to fit it in round the children. I started off selling children’s books, but specialised in horse and pony stories as it was a genre I’d always loved myself, and no one else was specialising in it. Yes, I had. I’d spent some years doing freelance computer training, which had morphed into writing training manuals and courses. I started off part time. I was also working part-time in the local library, which kept me going until I could afford to move full time to the book business. Don’t put all your eggs in one basket, which I did with Royal Mail because they gave me so much work. When they closed the consulting arm, I was sunk. My other clients had all gone off and found other writers. We’d also moved out of London by then; I was really struggling to find childcare and it was all distinctly hairy for a bit. As above, and also to focus. Decide what the main focus of your business is and don’t let yourself get side-tracked. I read a while ago in a book sellers’ magazine that whilst research was all very interesting, it was not time selling books. That is absolutely true. Despite the above, I don’t regret moving into researching authors. Originally this was done to add value to my website, but it did rather take over. As a result, I’ve been able to move back into my first love, writing. I was approached to write a book on my speciality, the English language horse story. Get out there: network, make friends with other business owners. Do what works for you: Facebook, Twitter, business groups. There is such a lot you can learn from other people, and when things get hairy you will have a support network. These days, you can’t just sit there and wait for customers to come to you. You need to build yourself as a brand. My original plan was to grow the book business much more than I have. I’ve diversified into writing. A very good question. My current plan is to concentrate on high-end and harder to find stock, which should sit better with carrying on writing. You can find Jane online at www.janebadgerbooks.co.uk and her blog is here – she’s also on Twitter and Facebook and you can contact her by email. Do you ever look at your blog or website statistics? If you don’t, I’m going to show you why you should. If you do, do you get all you can out of them? Do you look at them actively or passively? Note: this post uses examples from the WordPress.com statistics pages, because that’s the blogging/website platform I use. But all of the standard blogging sites, plus Google Analytics, Statcounter and other analysis tools will offer you similar information, with similar headings. Why should I look at my statistics? Which posts or pages are people looking at a lot … and which ones are they ignoring? Is there a kind of post that people are particularly interested in? When do people read your posts? Where do your readers go next – what links do they click? Are people finding your site via other sites and blogs? How do I find and view my blog / website statistics? Now we’ve located our stats, let’s look in more detail about what they can tell us. 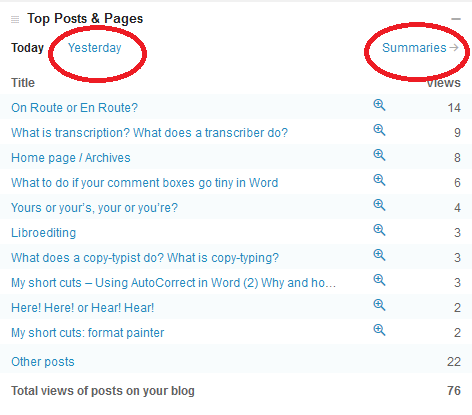 How do I tell how many times my blog posts have been viewed? One of the important ones to look at is your most popular pages. 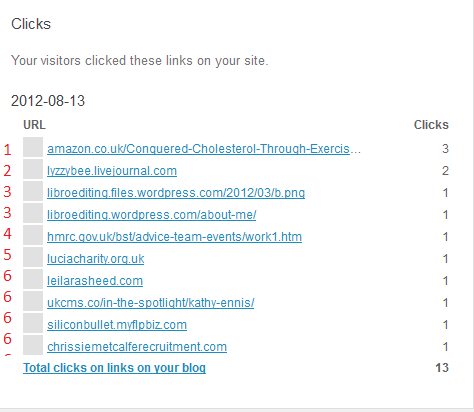 We’re looking at one day here, and I can see that my blog post on on route or en route is, yet again, the most popular. 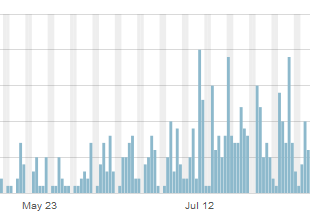 But I can also see what other posts and pages have been popular (and if I click on yesterday or summaries I can see previous days’ stats, while if I click on the magnifying glass next to the number, I can see all the views for that post). This is useful, as I can tell how I’m doing in the search engines, if it’s an older post, or whether my alerts are doing well, if it’s today’s post going up the ratings. 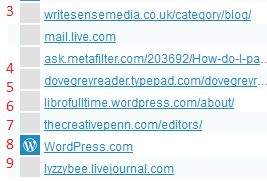 How do I tell how people have found my blog or website? 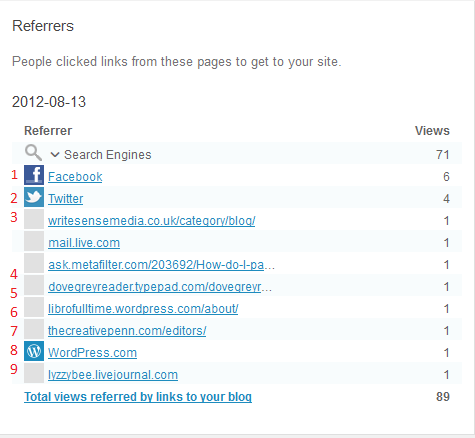 It’s very useful to know how people are finding your blog. You should have a section of statistics called something like referrers or referrals. Here are mine for a particular day. You can glean all sorts of information from this. At the top you can see I get most of my hits from search engines (over 70 of that day’s hits so far), then Facebook (1) and Twitter (2), then a variety of websites and blogs that I’ll go through in a minute. This has changed – when you’re new to blogging, you’ll get most of your hits from Facebook and Twitter and other social media, as your friends will be looking at your posts and you will be promoting them on social media. As your blog gets indexed on the search engines, results will start showing up from them. 3 comes from one of the people I’ve featured on my blog blogging about my feature herself – a great link-back that Google will like indexing. 4 is from an answer I gave (with a link) on an expert site. 5 is from a comment I made on someone’s blog. 6 is from my other blog. 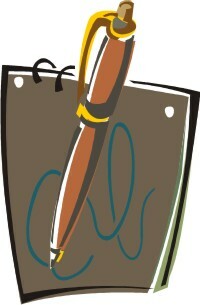 7 is from a list of editors a client added to her website (very valuable). 8 is from WordPress itself, probably someone surfing through tags, and 9 is from my old LiveJournal blog, where I post links to this blog/website. All good stuff, and I can say thank you to people who have sent readers my way, or even find out when they’ve done so (all these links can be clicked, so I can see exactly what people have said). Now, what about those search engines? How can I find out what search terms people have used to find my site? You should have a heading like Search Terms somewhere on your stats page. This offers a world of exciting information. Clicking on Other search terms will give you the rest of the terms people have searched on – that they will only have tried once (or only one person has tried). For a start, you can see exactly what people are searching for. It might be useful to change the wording on your blog posts to get further up the search results for a popular term. It’s also worth searching for these terms yourself and seeing where on the Google results page they appear. Another useful point is it can give you ideas for future blog posts. 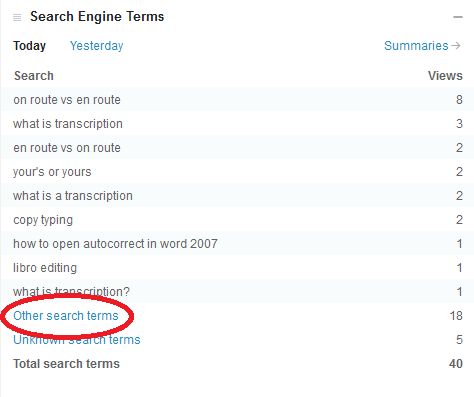 I noticed that someone had found me while searching for Autocorrect, which I had mentioned in a blog post. So then I wrote a post on Autocorrect itself, which has been quite popular. It can also be quite amusing to see what people search for. Someone once came through to my blog having searched for “persuasive piece on children believing in the tooth fairy” – I think they may have been disappointed (they found me because I mention the tooth fairy in an example sentence explaining a word definition). How can I see where my blog readers are? 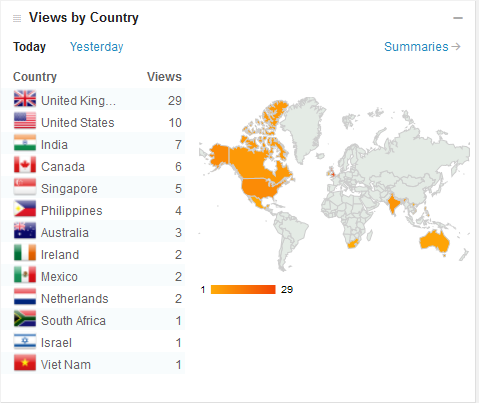 On WordPress you can see a rather nifty world map with the countries from which your visitors have come from highlighted. This is more of a fun distraction than a useful tool, to be honest, but if you discover an anomaly, for example if you’re in the UK and you get a lot of visitors from Brazil, you could consider tailoring some of your blog posts for this market. I get a lot of international visitors, so I’m going to make sure I talk about my work with non-native speakers of English soon. Is my website traffic increasing? What did I do to make that happen? As well as today’s data, you can usually see a month or year’s worth, too. If I look at the traffic on my website and blog over time, I can see that it started increasing at the beginning of 2011. What did I do at the time of that red arrow? Started writing this blog! 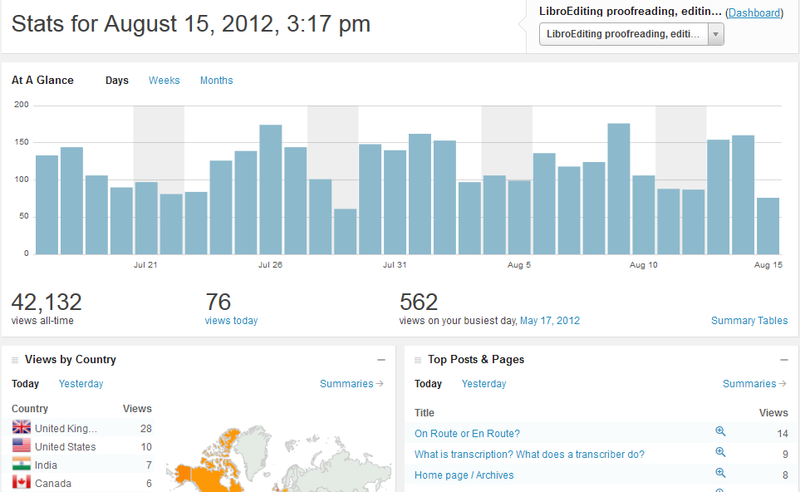 Do people read my blog more at the weekends? Looking at your daily traffic will show peaks and troughs. If your blog is more popular at the weekends, it might be good to post new content then. If I drill down into one of my blog posts, the ever-popular “What do I do if my comment boxes go tiny in Word?”, I can see that it’s not read very often at the weekends. This says to me that office workers are looking for and using this post, so I can make sure I post more for that kind of audience and save other new posts for the weekends. Where do my website visitors go when they leave my site? You can see that the click-throughs fall into a few groups. 1 is my ebook, which I have linked to in a blog post and on the site itself. Hooray – my PR campaign is starting to work! 2 is a click to my Livejournal blog, linked to on my website. 3 is a pair of pages on this website, filed under my old url but I can see people are navigating around the site and sticking around. 4 and 5 are both links I have on blog posts; 5 is also on my references page. And all those marked 6 are websites of people I’ve featured on my blog, showing that I’m helping them get some traffic, too. So there we go. Look at those statistics, whether you’re using WordPress or another host for your blog. And look at them actively: think about what they mean and how they can help you to find out how to tailor your blog to your audience and drive more traffic to your blog or website. If you’ve enjoyed this post, please click on one of the share buttons below, or leave me a comment. Especially if you’ve had any amusing search terms recently! 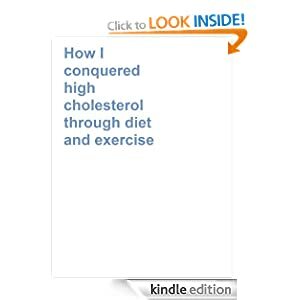 As well as writing and editing for other people, I have been busy writing my own guide to dealing with high cholesterol through diet and exercise. I’ve published it on Kindle and it’s available now. If you or a family member or friend has been diagnosed with high cholesterol, whether or not you are taking statins at the moment, this guide can help you reduce your intake of saturated fat and increase your intake of substances that promote cholesterol reduction, so that you could possibly come off statins or not go on them in the first place. I’m not making any wild promises, but this system has worked for me and some of my friends, and the book cuts to the chase with easy-to-remember guidelines. It does try to accentuate the positive, so there’s lots of information on what you CAN eat and enjoy. If you’re interested, please click through. There are some great reviews on there right now. And even if you don’t decide to buy a copy, please consider clicking on the “Like” button. Enjoy! It’s time for another small business chat update! I have been featuring a fellow small business or freelancer on this blog every week for over a year now, and I’m checking in with all my interviewees to see what they’ve been up to in the past year. I had hoped we might be further on with taking an apprentice on, but we still don’t feel quite ready for that yet. We have a freelance bookkeeper working with us (my brother) and our 16 year old son is helping out, having done his GCSEs – we feel happier keeping the business within the family. I have found some wonderful new regular bookkeeping clients who see me monthly, pay their bills on time, and I really enjoy working with them. Also I am selling more Sage software through my networking clients. I have branched out and become an independent distributor of Forever Living products, which I do through Silicon Bullet even though it is a complete departure from what we usually do. It is good to have a revenue stream which does not depend on an hourly charge for my time, and I can devote as much or as little time as I like to the business (check out www.siliconbullet.myflpbiz.com for more details). The training and support available from my Forever Living team and sponsors is applicable and helpful in every part of my business. I have learned to push myself out of my comfort zone more at networking. It is best to go alone rather than with a friend as you then get out there and connect with people. It is also OK to resign or stop working for clients who drain your energy or who are constantly awkward about paying bills – it is not worth the time and effort, and there are plenty of other people who need you who will not cause you such a headache! I am still working on this one myself! Networking is not about selling your business, it is about building relationships – the business comes along naturally when people get to know you. Always look to see how you can help others with their business and links you can make between people –they will then do the same for you. I hope to have built up a great team around me in the Forever Living part of my business, whilst also enjoying my bookkeeping and networking to build up the IT side of our business. It sounds like things are going really well for Aly, with some new ventures and diversification (I’ve been diversifying this year, too – more about that on the blog some time soon). Let’s not forget Aly’s Silicon Bullet blog, either, which has been getting a good reception and building up its audience. I think this next year is going to be a good one for Aly and Paul (and the rest of their family) and the business(es). And here’s what happened next! The Silicon Bullet blog is great reading if you use Sage products, and has links to their Facebook page and Twitter stream, too.